For more than a decade Gaza has been subject to a crippling economic siege. In this piece, Jamie Stern-Weiner writes about the ongoing catastrophe. 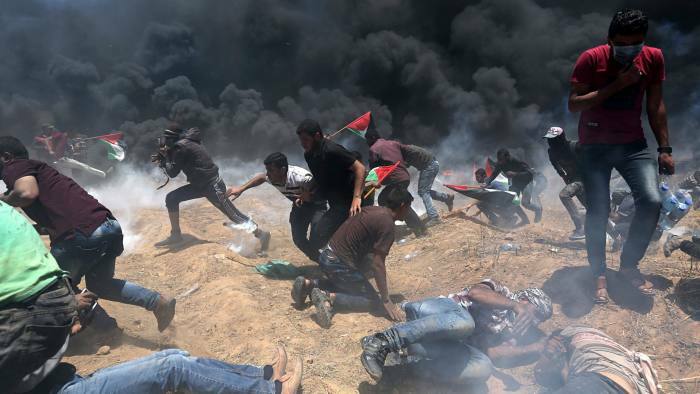 Emergency demonstrations in solidarity with the people of Gaza have been called in London (Downing Street, 5.30pm) and across the UK for today, 15 May. This world is replete with morally complex problems and finely-tuned ethical dilemmas. Gaza is not one of them. For more than a decade, Gaza—a narrow strip along the Mediterranean coast—has been subjected to a suffocating economic siege. The siege was imposed by Israel and its international accomplices after the election of the Hamas government in 2006, as a form of ‘economic warfare’. The objective was to cripple Gaza’s economy in the hopes that the suffering thereby inflicted would induce Gaza’s civilian population—70 percent of whom are refugees and more than half of whom are children—to turn against their rulers. To this end, the flow of goods as well as people across Gaza’s perimeter was reduced to the bare minimum. The guiding principle was explained by one of the architects of Israel’s Gaza policy, Dov Weisglass: ‘It’s like a diet—the Palestinians will lose lots of weight, but they won’t die’. That is, humanitarian aid would be allowed entry but the inputs required for a functioning economy would be blocked. International human rights organisations have unsurprisingly condemned this mediaeval-like policy as a ‘collective punishment’ (International Committee of the Red Cross) imposed in ‘flagrant violation of international law’ (Amnesty International). At the same time, the Israeli military launched large-scale assaults on Gaza in 2008-9 and again in 2014, which together left more than 2,500 people dead—overwhelmingly civilians—and some 24,000 homes destroyed. In most conflicts, the population can, as a last resort, evacuate to safer ground. But the people of Gaza are trapped on all sides: economically strangled and pummelled with advanced weaponry, they are unable even to flee. As a result of this protracted siege, punctuated by periodic massacres, Gaza’s economy has been all-but extinguished and its people reduced to beggary. Fully 80 percent of the population is now reliant upon international food aid, while as of 2015, the unemployment rate had reached 43 percent—probably the world’s highest. The very viability of Gaza is now in doubt. Gaza’s only freshwater aquifer is on the threshold of irreversible contamination—96 percent of the tap water in Gaza is now unfit for human consumption—and the United Nations has warned that Gaza may be physically ‘unliveable’ by 2020. It is to escape this fate that the people of Gaza have, each Friday for the past seven weeks, mobilised in their tens of thousands by the perimeter fence. The Great Return March, as these demonstrations are known, has been overwhelmingly nonviolent. But Israel has responded with what Amnesty International describes as a ‘murderous assault’ and what Shadow Foreign Secretary Emily Thornberry has termed a ‘vicious and utterly avoidable slaughter’ against unarmed demonstrators. This is about individual snipers safely ensconced hundreds of feet, even farther, away, targeting individual protestors and executing them one at a time. Or as Israeli human rights organisation B’Tselem put it: ‘soldiers – including snipers – fired for hours on end at protesters’. Israeli snipers have been using high-velocity bullets as well as hunting ammunition that expands inside the body and causes exit wounds the size of a fist. Doctors with Medecins Sans Frontieres report that ‘most of the wounded will be condemned to suffer lifelong injuries . . . What happened today is unacceptable and inhuman’. This devastation was not accidental but reflected official policy. As Israel’s Defence Minister proclaimed on the eve of the protests, ‘there are no innocents in Gaza’. On the other side, not a single rocket has been fired into Israel and not a single Israeli casualty has been reported. Today, 15 May, will see the culmination of the Gaza protests: a mass jailbreak in which the people of Gaza will attempt to escape what even former UK Prime Minister David Cameron described as a ‘prison camp’. The stage is set for yet another bloodbath. What has been done to Gaza over the past ten years has been done in full view; no-one can credibly say they did not know. Gaza’s suffering is the world’s shame. Beyond this, we in Britain bear a special responsibility. The British government has collaborated in imposing the siege of Gaza and it has continued to sell weapons to Israel despite Amnesty International’s repeated calls for an arms embargo to prevent war crimes. In 2017 alone, the UK issued export licenses for £216 million worth of arms sales to Israel, including sniper rifles. Palestinians are often advised as to the virtues of Gandhi. But as a Guardian headline put it, ‘Palestinian nonviolence requires global non-silence’. As Gazans attempt to break free of their prison, their only protection, their only armour, their only defence against the wall of Israeli snipers, is us. Emergency demonstrations in solidarity with the people of Gaza have been called in London (Downing Street, 5.30pm) and across the UK for today, 15 May. Spread the word! Jamie Stern-Weiner is the editor of Moment of Truth: Tackling Israel-Palestine’s Toughest Questions (OR Books, 2018).